The International Market Place, an island of culture in the heart of Waikiki, is an intriguing complex of exhibits and shops which feature the art work, crafts, music and dance of the various ethnic groups of the vast Pacific. Visitors to Hawaii and the people of the islands consider the Market Place to be an attraction which ranks high on the list of "must-see" sights in Honolulu. In July of 1962, LANAKILA produced and directed at the Market Place � the HAWAII BASTILLE DAY TAHITI FETE, a two-week extravaganza which duplicated the famed Papeete Festival. In all degrees it equaled the original. The outstanding success of the Fete has assured its becoming an annual affair, ranking with Aloha Week as one of Hawaii's most noteworthy events. 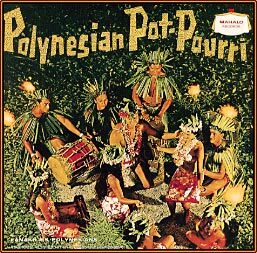 MAHALO RECORDS now proudly presents POLYNESIAN POT-POURRI, an album which preserves for all time the excitement and sheer beauty of the songs and dances as performed at the 1962 Fete. The gifted leader of The Polynesians is LANAKILA BRANDT, Entertainment Director of the International Market Place and a veteran of 21 years in the show business world of Hawaii. A personable islander of Hawaiian-Caucasian extraction, he has been during his career a disc jockey � comic dancer � guitarist and Tahitian drummer � an Otea and solo dancer � director and producer of Polynesian shows � choreographer � and owner and director of the famed Brandt Dance Studio on the Big Island of Hawaii. Lanakila is a lifetime student of Polynesian culture and is well known in Hawaii as an expert in the field of chants and meles and the many varied dance forms of the Pacific area. He is married to the beautiful island entertainer, KAU'I, and it is she who is featured vocalist in this album. N/.B. The music on this CD reflects one facet of Kahu Lanakila K. Brandt's life. At the time these recordings were made (1962), he was a professional entertainer. Since 1967, his Kahanahou Hawaiian Foundation in Kealakekua, Hawaii, has produced authentic Hawaiian hula implements and musical instruments. For the past 40 years he has been a consecrated priest of the order of Lono at Pu'uhonua o Honaunau (The Place of Refuge). He is a Kahuna La 'au Kahea and spends much of his time doing spiritual healings on people with serious illnesses who come to him for help from all over the world.